To my surprise, moving to Seattle quickly transformed me into a Mariners fan. I previously had no baseball team that I actively followed, so I guess I should have seen it coming. But I didn't. And my fan-dom continues to grow each year. This past year was a giant disappointment for the Mariners. They were projected by many to have a strong year, and possibly win their division and make it to the playoffs. But instead, they got off to a slow start and never rebounded. Players who had been previously successful suddenly slumped, a team that was supposed to play great defense had more than their share of errors, and a bullpen that was supposed to be incredible was far from good. The only strength on the Mariners' team was their starting pitching, but this was countered by the lowest run-support in the league. While the Mariners will undoubtedly be rebuilding for the next few years, there is reason, however, for optimism. The Mariners just hired a new coach, Eric Wedge, who has been successful in the past, have a core of young players who are projected to have great success in the future, and have a definitive pitching ace in Felix Hernandez. I regularly follow the blog of a guy named Dave Cameron, who is a brilliant Mariners fan and does great analysis of the team. He has predicted some moves that the team might make in the off-season, and the possible team that the Mariners might field in 2011. 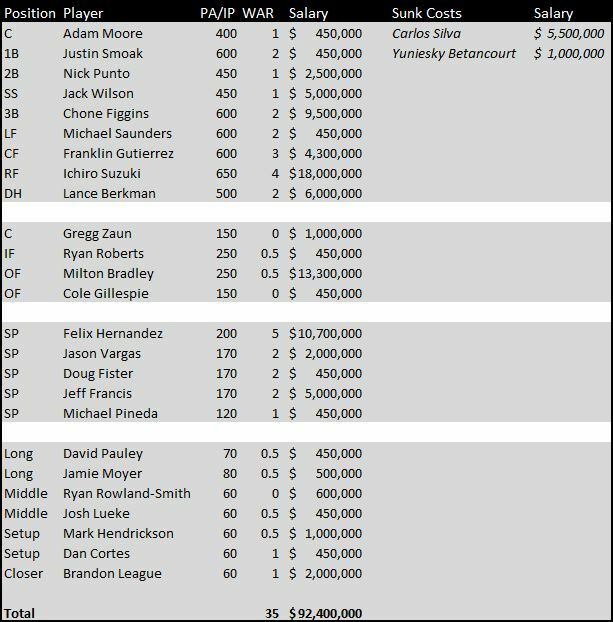 Here is the chart that he put together of his best guess at the upcoming moves from the Mariners' front office. You can read the rest of his post HERE.